So... what ever happened to the movie? Just figured I might as well toss this question out, in the rare chance of at least a partially official response. Re: So... what ever happened to the movie? If there is a Prey movie in development, I could not find any information about it. I was under the impression that it was just a rumour. "Just a rumour" meaning that it's not even optioned. It doesn't help that there have been several films called Prey and more in production. None seem to be related to 3D Realms'. If there is a Prey movie in development, I could not find any information about it. 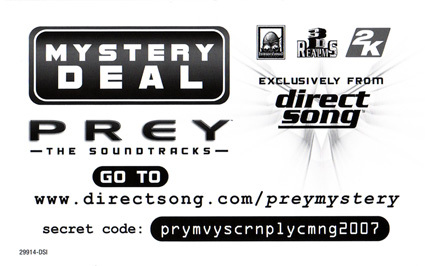 "prymvyscrnplycmng2007" means "Prey movie screenplay coming 2007". And there's a Prey entry in IMDB, where the information is only available for paying subscribers. I knew about that screenplay code. That was from 2006. It's 2009 now and there's been no further news. The only lead is an IMDb link which could easily be for some other film. Besides, subscriber-only pages are usually for tentative films, which doesn't bode well either, if that is this Prey. Prey is a good story so I wouldn't mind a movie. They just need to tap into the Indian powers of the main character a bit more. The main Indian character should be played by Lou Diamond Phillips. I'd like to know if the screenplay actually even got finished, and if they started offering it to production companies or not. Just seems like one more thing that 'should' have brought in more money for 3DR, and never panned out. And that's pretty sad, because the Prey storyline has far more potential for a film than a lot of the PoS game-->movies that have been made. If anything it would of brought in money for Radar not 3DR as they own the rights I do believe. None of the Prey movies currently in development have anything to do with the game Prey. I checked them up on IMDbPro. Even though he is Filipino, thats not a bad idea. man i think that most games should be b-movies, much better than the hollywood millions of dollar productions with always the same actors. Now, on with that, I really do believe they could make a good Prey movie. The entire game felt like one in all honesty, so I don't see why not. Hire the right actors, get some decent special effects team, keep the dialog fresh and NOT corny (remember the Doom movie and how much of a train wreck that was? ), etc. Right now they are focusing far too much on developing Prey 2, however. And in all honesty, I would much rather them work very hard on that sequel and have the game turn out phenomenal, rather than try to develop Prey 2 and brainstorm a movie at the same time and have Prey 2 delayed or rushed to release and not as good. But once Prey 2 is in stores (or they are nearly finished beta testing) then I could see them starting a movie rumor again but this time actually living up to it.